Backed by the secularist media, namely Halk TV and the Sözcü newspaper, Turkish journalist Yılmaz Özdil acts as if he is the only modern-day contemporary writer who preserves Mustafa Kemal Atatürk's legacy. Sorry to say this is not the case. New works have been published during the past six months, such as professor İlber Ortaylı's book "Gazi Mustafa Kemal Atatürk," which contains a bibliography; Sinan Meydan's "Sarı Paşam" which contains a bibliography; İpek Çalışlar's "Mustafa Kemal Atatürk – Mücadelesi ve Özel Hayatı," which contains a bibliography. The fact that Özdil's biographical/novel doesn't feature footnotes, documents, bibliography, index, all of which are deemed necessary for such a historical biography, is an affront to his fellow authors, researchers, historians, not to mention Atatürk's memory. Yet 1881 copies of a special hand-bound edition of this work were sold for TL 2,500 apiece in four hours on Jan. 23, a date which by the way, has no particular bearing on the history of the Republic or Atatürk's life. Supposedly, proceeds from these sales will go to charitable causes. A handful of these special copies have since been put on the block of the Turkish ebay site, gittigidiyor.com at prices ranging from TL 4,999 on up to TL 50,000. Moreover, not unlike the Sacred Relics at the Topkapı Palace Museum, Yılmaz Özdil's own personal copy of the special edition will be visible behind glass at the KırmızıKedi Publishing House headquarters in Beşiktaş. This business of promoting books should not be conducted in the manner of a three-ring circus. In this regard, we need to demonstrate a sense of modicum, humility and respect. Atatürk was a humble man and would have frowned at those showing off how 1881 copies of a special-edition book written in a fancy, flowery Sunay Akın-like second-hand fable style sold out between 60 seconds and four hours starting from the time he passed away: 09:05. Likewise, if you have plans to donate the book receipts to your favorite charity, there is no reason to keep pummeling your readers that you have done so or that you plan to do so in the town crier genre. In other words, if you are expecting accolades and applause for your efforts, you will not get them from true Atatürk admirers, academicians or historians, because these folks are all fully aware that Atatürk would have never approved of such amateur-hour showman tactics. While Yapı Kredi did not create such fanfare for İpek Çalışlar's work, Kronik Kitap, which is located just 20 meters from KırmızıKedi, also declined to conduct such brouhaha for Professor İlber Ortaylı's work, İnkilap also didn't join the bells-and-whistles bandwagon to promote its prolific writer, Sinan Meydan either. Why not? Because these publishers know that Atatürk would not have approved of such shenanigans. 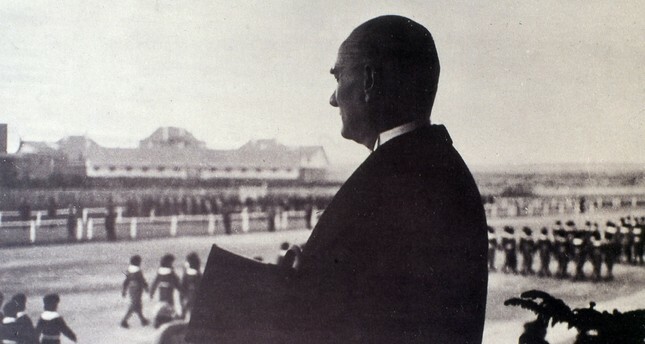 In 1931, Atatürk was quoted as saying, "Writing history is just as important as making it. If the writer doesn't remain loyal to the history maker, the invariable truth will take on a quality that shocks people." Mistakes there are, and they are not of the typographical sort, either. Picardie Maneuvers, Oct. 23, 1910, pilot Capt. Louis Madiot was France's first military aviation casualty when he crashed in his Breguet biplane, an accident that Staff Capt. Mustafa Kemal had witnessed. In his book, Özdil claims there were no air accidents in France in the year 1910 (Pages 46-47). Özdil's claim that Cemal Granda called Atatürk a "Sabetayist" (member of the Sabetay Sevi cult is not substantiated in the 1st edition "Atatürk'ün Uşağı İdim" (I Was Atatürk's Butler) (Hürriyet 1973) (Pages 338-341). Oddly enough, while Özdil did not feel the need to include a bibliography, he admonishes potential researcher/writers from using to Granda's book as a reference. This makes absolutely no sense as Atatürk employed Granda as his butler between 1927 and 1938. Contrary to Özdil's claim, Topal Osman did not raid the Çankaya Villa where Atatürk resided. Contrary to Özdil's claim, Hagop Vahram Çerciyan was not the one who created Atatürk's signature (Page 182). The name of a female relative of Atatürk's was "Vuslat" and not "Vüsat" (Page 271). U.S. Chief of Staff Gen. Douglas MacArthur met with Gazi Mustafa Kemal at Dolmabahçe Palace on Sept. 27, 1932, not in 1931 (Page 303). The photograph of Gazi Mustafa Kemal sitting in the sidecar of an English Ariel motorbike was taken during the visit of the King of Afghanistan, Amanullah Khan and his family in Ankara on July 14, 1929, not in 1934 (Page 333). Contrary to Özdil's claim on page 54, Atatürk did not write letters to the Christianus family for three or four years after his return to Turkey in January, 1915. However, he did write the family four letters from Çanakkale in 1915. Contrary to Özdil's claim on page 162, Aircraft Engineer Reşit Selahattin Alan did not built the first aircraft in Turkey. That honor belongs to Vecihi Hürkuş, who constructed his K-VI and flew it in January 1925. Özdil contradicts himself when he mentions the first biography about Mustafa Kemal was written by Bulgarian Turks in 1920 (Page 32), then says the first biography about Mustafa Kemal was entitled "Grey Wolf" and written in 1932 by a British intelligence captain named Harold Courtenay Armstrong (Page 454). While there is no information available about the Bulgarian Turk biography online, it is known that Michel Paillares penned a biography about Mustafa Kemal entitled "Le Kemalisme Devant Les Allies," which was published in 1922. There was another Mustafa Kemal biography published in 1922, which was written by Egyptian Kerim Halil Sabit and Syrian journalist Emin Muhammed Said and entitled "Gazi Mustafa Kemal Paşa'nın Hayatı - Anadolu'da Türk Milli Mücadelesi" (The Life of Ghazi Mustafa Kemal Pasha – The Turkish National Ordeal in Anatolia." Regardless of Yılmaz Özdil's claim that the book he worked on for 10 years is not a biography, but rather a novel, he still needed to present his sources to his reader in the form of a bibliography, because that is something befitting the memory of Atatürk. Case in point, "The Speech" (Nutuk) which Atatürk spent three months (not 10 years) writing and 36.5 hours orating in the Grand National Assembly over six days between Oct. 15 and Oc.t 20 in 1927, was originally a three-volume work, the third of which is comprised entirely of documents and references. It is sufficed to say that as long as sources are not mentioned and credit is not given to those who assisted in his 10-year long research study of the life of Gazi Mustafa Kemal Atatürk, Özdil's "Mustafa Kemal" will never measure up to "The Speech," regardless of the exotic paper it is printed on or the long-forgotten binding techniques utilized to hold it together, or regardless of how much it sells for on gittigidiyor.com, eBay or nadirkitap.com.